For those who know me, this will not come as much of a shock: I HATE Daylight Savings Time. Like, with a passion. I understand that there was a point in time when adjusting the working clock to enable factory employees daylight hours to garden seemed like a sensible thing to do. But that time has LONG passed. A majority of Americans don't need that extra time, or they work from home, or their working schedule is flexible. The time change lasts a period of 8 months (Mid-March to Mid-November), much longer than the seasonal light and the traditional vernal to autumnal equinox period. Energy is wasted cooling houses (especially in the south) for longer evening hours in the summer and for lighting dark rooms in the spring and fall mornings. There are even studies out that show a dramatic increase in accidents the Monday following the time loss with no correlating increase in safety after the time gain. I could go on and on and on about damaging effects that happen on other people. 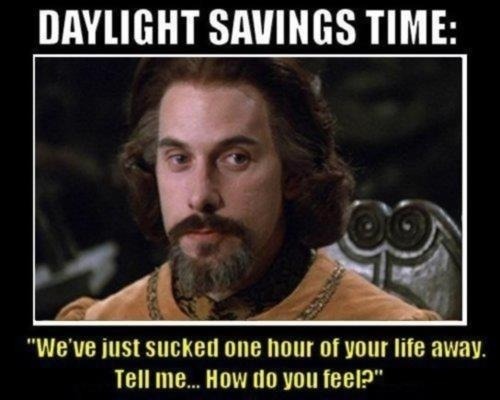 For me personally, though, it's really hard to adjust my sleep schedule and takes me about a full week each time we have to do the DST change. And don't start on the "I bet you love gaining an hour in the fall" bit. 'Cause I don't. It messes up my sleep schedule for another full week and leaves me feeling in the lurch. This vile loathing was made worse this morning by the fact that my iPod alarm clock for whatever reason set itself forward ANOTHER HOUR last night after it had already set itself forward an hour Saturday night. So when my alarm went off this morning at 6:30 and I showered, dressed, got breakfast made and lunch packed, I looked up at the kitchen clock (an old manual one I had already changed over Sunday morning) and realized that my alarm really went off at 5:30 this morning. I had lost ANOTHER hour of sleep. And this morning I was dragging. Work was lurchy. I was hungry all day. I couldn't think straight. It was terrible. And it's really hard to be thankful for a computer glitch that caused me to lose an hour of sleep after the US Congress already made me lose an hour of sleep. It's Chris Tomlin's new song "I need You"
And I was so overwhelmed by my weakness and my dependency on God and His Strength. I need Him every hour, but I really need Him today. When I am tired and weary and bitter towards my circumstances, I need Him. My One Defense, My Righteousness, Oh God, how I need YOU!